This is Adam and Charles Black's rare 1844 profile view of the Andes Mountains, particularly Ecuador's Mt. Chimborazo, based upon an influential 1805 illustration by the renowned German explorer and scientist Alexander von Humboldt. Among the first scientists to take Kant's philosophy of Transcendental Idealism into the scientific field Alexander von Humboldt illustrates discoveries made on his ascent (the first) of Mt. Chimborazo. Humboldt, as a well-educated German nobleman, was heavily indoctrinated into the philosophy of Immanuel Kant. During his epic journey into South America, Humboldt used illustrative techniques to catalog, define, and reason through the scientific data he collected. His published work is full of illustrations, maps, and charts, many of which were incredibly influential. In our case, we must focus on Humboldt's profile of the Andes 'Geographic der Pflanzen in den Tropenlandern, ein Naturgemalde der Anden.' Humboldt's 1805 chart, is not strictly speaking a comparative mountains and rivers chart, however, it was extremely influential with regard to the development of the genre and is one of the earliest examples of a 'more formal and scientific means of expressing the vertical dimension.' 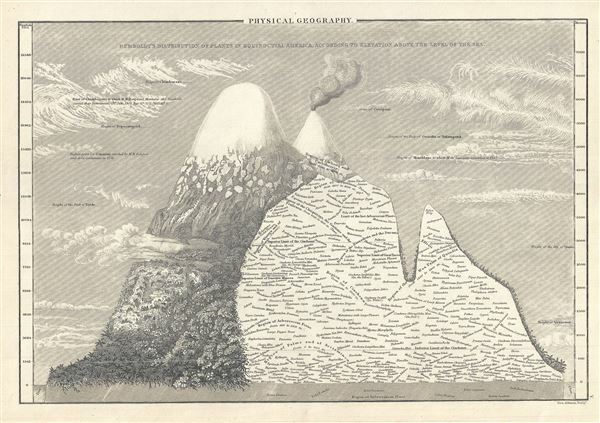 With this chart, Humboldt was attempting to illustrate his research and experience in climbing Ecuador's Mt. Chimborazo. At the time Chimborazo was considered to be one of the world's tallest mountains and indeed, though dwarfed by Everest, Chimborazo may still be considered the tallest mountain in the world if measured from the center of the earth. Humboldt's ascent of Chimborazo was a significant accomplishment, not only because he reached an unprecedented altitude, but also for the detailed scientific observations he took along the way. Possibly influenced by the mountain profile diagrams he worked with as a mining engineer in Germany, Humboldt commissioned a Viennese landscape painter to assemble this chart according to his specific instructions. The chart compares and contrasts vegetation and mineral composition, noting tree and snow lines, rock forms, and even some subterranean elements. While only Chimborazo is specifically drawn in profile, Humboldt sets the stage for future development of the comparative mountains genre by textually noting the elevations of several other well-known mountains, including Popocatepetl, Mont Blanc, Vesuvius, and Orizaba, as well as the elevation of Quito and the highest point reached by Condamine. Prepared by Adam and Charles Black an engraved by George Aikman for issue as plate no. V in the 1844 issue of Black's General Atlas.